Pantheon Group offers a range of services, providing our customers with the perfect blend of skills your projects need: software development and architecture, networking and virtualization, backed by system integration and support and supplemented by premium quality back office services. Professional investment advisory on real estate, art and collectibles, including money and stamps. 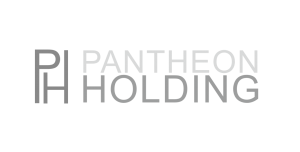 Since we’ve entered business, we’ve had a plenty of opportunities to improve the skills originally needed for running Pantheon Group. Over the years, our experts became masters of their skill until we’ve ended up a group of software engineering pros surrounded by HR and accounting ninjas, project management mavens and legal aces. It was only natural to share these skills with the world and offer them to our peers and customers. Be it consulting, the legal department, accounting or HR, Pantheon Group’s services are always a smart choice providing you with the perfection you deserve. Looking for software engineers and architects? We know you deserve the best and are ready to help. Waters of legislation regulating the business environment can be especially rough. Navigate them safely with us. Designing, and even running projects for our clients with the sophistication of our project managers. We help new companies with skilled personnel, know-how as well as initial capital in order to create industry champions. Why not leave launching a new company to someone who knows the snags and can make the most of the perks? We’ll take care of your investment and real estate, letting you focus on the business you love. Providing expertise in buying and selling art and collectibles in fields of numismatics, philately and notaphily.